We may joyfully believe that there was, that there is, one to whom no human suffering and no human sin is strange, and who in the profoundest love has achieved our redemption. It is such joy in Christ, the Redeemer, that alone protects us from the dulling of our senses by the constant experience of human suffering and also from accepting as inevitable the suffering in the spirit of resignation. This week, sitting in Starbucks was more than about burrowing in my preferred writing spot. It was also due to the fact that our office was closed and without electricity since Monday, when Hurricane Sandy hit Maryland. Only late yesterday power restored. Fortunately our Staff found creative ways to meet, study and work in spite of the circumstances. We got off easy. 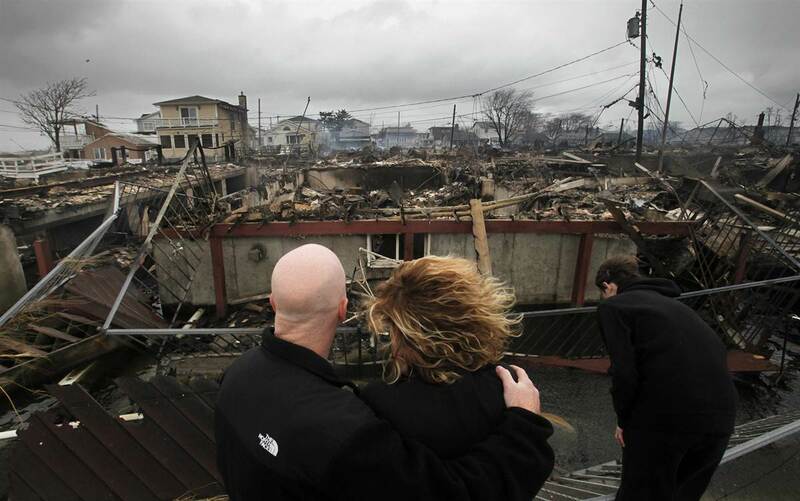 The devastating consequences of Sandy’s wrath in states like New Jersey and New York will yield decades of aftereffects and sorrow. Loss of life has been high, and is climbing. Homes were demolished and entire communities obliterated by water, wind and fire. The sorrow that comes through in news stories and interviews is almost too much for Katherine and I to bear. Having lived through hurricanes, and having experienced two historic floods in Mississippi during college and grad-school years, I can tell you that there is nothing romantic about going through something like this. Jobs will be lost. Lives will be altered. Families will walk away from their homes, never to return. Relationships will be tested to the brink. Opportunists will exploit desperate people. The world many know will never be the same. When Hurricane Andrew demolished much of the southern hemisphere of Miami in 1991, a friend (and one of my models for leadership), Ray Goode, the one-time City Manager, along with another city leader, decided to launch a campaign called, ‘We Will Rebuild.’ They rightly resolved that the city was worth restoring, and so as he dealt with the devastation on his own block, Ray led Miami in an effort that was nothing short of Herculean. Relief is more than a physical dynamic. It is a resolve. And it is something that doesn’t happen effectively in a vacuum and without a larger community of people committed to something greater than themselves. The most enduring and effective relief efforts happen when broken people recognize their own condition in the lives and events of others, and then act on them – together. A long time ago I discovered something about Jesus that I might not have guessed in my ‘neat’ and ‘responsible’ universe. As you follow Him, and observe how He is constantly confronted by the pathos of people who bear the effects of a fallen world, you discover that He only ever offers relief. What I mean is that He doesn’t ask how something happened, never ascribes blame, and makes no demands – He simply relieves burdens. His response to brokenness is never conditional. Because the crazy thing is that Brokenness is Jesus’ point of connection with humanity – it is the singular reason for His entrance into our world. And He wasn’t merely exhibiting His saving power, which would be enough. He was also demonstrating what the Church is called to, and how effective she could be by merely entering into and serving the very broken world Jesus came to save. Here is the thing: We are connected. All of us. When one person is cut, we all bleed. When one suffers, we grieve together. When a city lies in ruins, we are reacquainted with the reality of our shared condition. And when there is renewal, as one, we all have cause to celebrate. So we find connection in our shared brokenness. And in relief, together we taste of and share in the good mission of the One who is making all things new. You are currently reading Relief at unfinished1.